Connect @ Home Cohorts Kick Off in Austin! Home Connect @ Home Connect @ Home Cohorts Kick Off in Austin! 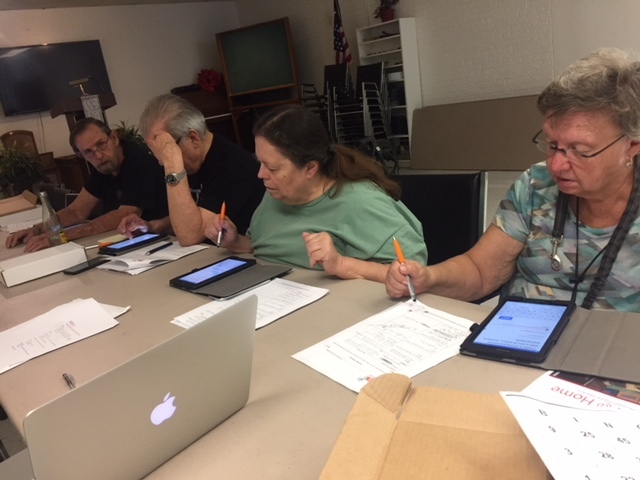 The new Connect @ Home cohort at several Family Eldercare communities in Austin began last week, getting a feel for their new Samsung tablet devices. Seniors from North Loop Apartments, RBJ, Oak Springs Villas, and Wildflower Terrace have taken their first steps to crossing the digital divide. The majority of them had never owned a tablet device before, and only a few had prior experience with mobile devices. They began their journey by learning about tablet vocabulary and how to maintain their devices. The Connect @ Home Program is designed to give seniors both the material and the experience necessary to harness technology to better their lives. Learners begin with basic tablet controls and work their way to various tasks, including video chats with loved ones and using social media to connect with new communities. Ultimately, the seniors will graduate from the 12-week program and keep their new tablets, with Family Eldercare supplying unlimited data for a further 6 months. Seniors also brought their prior knowledge to share in class. “This keyboard is just like the typewriter I learned in school,” learner Ivy Downden told the instructor and the other learners. For some, though, even the typewriter comparison seemed foreign. “I never learned to type back then,” Errol “Chance” Chancellor explained. “I thought that was just for girls. Now I’m really behind, but I’m ready to learn!” Several learners share Chance’s enthusiasm for picking up new skills in the digital age.